New Apostolic Leader, Bill Johnson, Teams Up With Catholic Priests to "Proclaim the Gospel"
Historically, Evangelicals and Protestants have stood on the unassailable truth that not only does the Roman Catholic Church hold to a false gospel, but that the papacy is the seat of the antichrist. According to the official councils of the Roman church, any who hold to the doctrines of Grace Alone through Faith Alone are considered anathema, and not part of the kingdom of God. Though nothing has changed in the doctrines and teachings of the Roman system, sadly, over half of Evangelical and Protestant pastors today refer to the pope as “brother in Christ.” The pope, a man who believes we are saved by good works, who officially practices idolatry on a daily basis, officially denies the Scriptures as finally authoritative, and officially anathematizes any who stand on the foundational beliefs of the Protestant reformation, is now considered “brother in Christ” by over half of those he damns. Of course, it’s one thing to simply refer to Catholics as “brothers” and “sisters,” but as Evangelicals, to actively engage in the promotion of Roman Catholic ideology and persuasion is a completely different affront to the gospel. 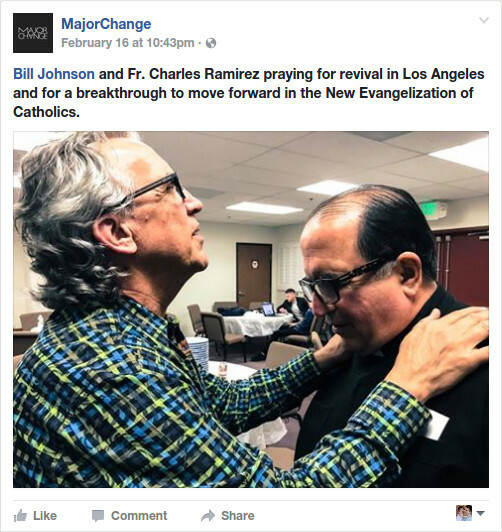 Bill Johnson, the New Apostolic Reformation “Apostle” out of Bethel Redding, has joined up with Catholic priests to promote the New Evangelization of Catholics. The following image, found on Major Change’s Facebook page, tells the story. The visible church as we know it has become so apostate that it’s unrecognizable. Not that Bill Johnson’s church has ever been a doctrinally sound church, to begin with, but historically, there has been a clear divide between different belief systems of professing Christianity. Today, it’s difficult to walk into any church and know what they stand for. There are no boundaries, and as long as you say “Lord, Lord,” you are considered a part of the church. You see, it’s those who practice and promote false doctrines that cause divisions and create disunity. We can never be united around a false gospel. We must stand on biblical truth, and refute the error espoused by these false Apostles and godless teachers who deny the power of God (2 Tim 3:5). Bill Johnson and the Pope typify this movement.